also we can lase the customized words on the product surface as you like. If you have any question or advice, please feel free to tell us, we can promptly reply in 24 hours. 1xpcs charm is inscribed with the sentence"blessed my dear grandma"
It will be a silent messenger to show your love and care to your dear grandma, also the perfect gift for your grandma in special day just as mother's day or birthday,christmas etc, you will like it! If you are already feeling it and want to have a try , click the "Add to Cart" to buy now! ♥【GIFTS for GRANDMA】♥ :It will be great grandma gifts to show your love and care to grandma,This bracelet will be a meaningful gifts for grandma such as Birthday, Mother's Day,Christmas day etc. 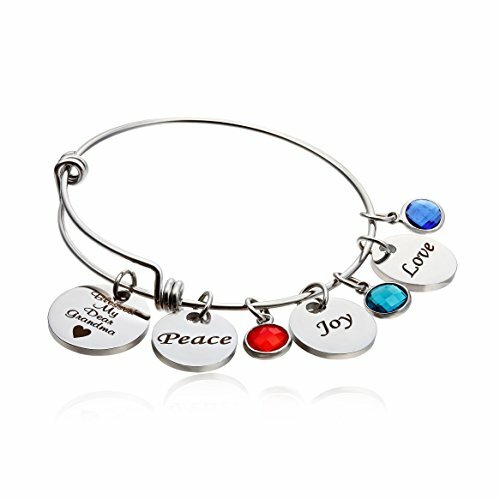 ♥【EXPANDABLE BANGLE BRACELET】♥ It is also an adjustable 2.5" in diameter wire bracelet ,suitable for women's from 6 inch to 8.5 inch wrist. ♥【PACKAGE AND AFTER SALE SERVICE】♥ :Comes wrapped in elegant gift box with blue cloth bag, ensuring The most beautiful presentation Possible. When you have any questions please don't hesitate to contact with us, we will try our best to help you. If you have any questions about this product by NBE Collection, contact us by completing and submitting the form below. If you are looking for a specif part number, please include it with your message.